Welcome to The Carvers’ Companion, the home of a wide variety of resources for and by woodcarvers. Now in its twen­ty-sec­ond year of pub­li­ca­tion, Wood­carv­er Online Mag­a­zine (WOM) is the first on-line “e-zine” for wood­carvers, by wood­carvers. Pub­lished six times a year, WOM is filled with reports of major carv­ing events, how-to arti­cles, pat­terns, book and video reviews, pho­to gal­leries, and reg­u­lar fea­tures such as Notes From The ‘Net. WOM is always free to all, thanks to the sup­port of a fine group of pub­lish­ers, carv­ing sup­ply, ser­vice and tool ven­dors. Click the logo at left or WOM in the menu bar to see the cur­rent issue. The World Wide Wood­carv­er Exchanges are an ongo­ing series of carv­ing exchanges. Hun­dreds of carv­ings have been exchanged by carvers in the US, Cana­da, British Isles and Aus­tralia. There is no fee charged, but you must be a mem­ber of one of sev­er­al wood­carv­ing mail groups. (See the Resource Files below). Click the logo at left or W3E in the menu bar to learn more. The Wood­Carv­er List, estab­lished in 1996, is the old­est carv­ing-relat­ed dis­cus­sion list on the ‘web. Some­thing over 600 carvers sub­scribe to the List, where a vari­ety of wood­carv­ing top­ics are dis­cussed by carvers rang­ing from sea­soned pros to new­bies with their first tool. Have a wood­carv­ing ques­tion? The List is the place to ask. Click the logo at left or The List in the menu bar for more infor­ma­tion or to sub­scribe. 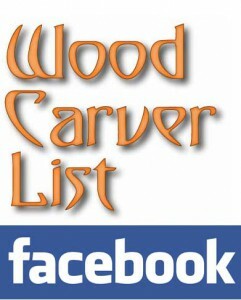 The Wood­carv­er List also has a very active Face­book group as an alter­nate to the email-based List. The Face­book group gives us a place to post pho­tos of recent projects, share tips, ask ques­tions, etc. To vis­it the group and join the 4,500 plus mem­bers, click the logo at left or in the menu bar under The List. Are you a new carv­er or inter­est­ed in carv­ing? Click the logo at left or New Carvers in the menu bar to head direct­ly to the New Carvers area. The Carvers’ Com­pan­ion Shop at Cafe­Press car­ries a wide vari­ety of wood­carv­ing-themed shirts, sweats, mugs, aprons, bags and lots of oth­er gifts and good­ies. Get your­self a great shirt and help sup­port the Carvers’ Com­pan­ion site at the same time. Click the logo at left or The Shop in the right hand menu to learn more. If you have ques­tions, requests, com­ments – click About in the menu bar and use the con­tact form you’ll find on that page. Cau­tion­ary State­ment: Wood carv­ing is a poten­tial­ly haz­ardous activ­i­ty and should be under­tak­en only with safe­ty a con­stant and pri­ma­ry con­sid­er­a­tion. To avoid injury thor­ough­ly under­stand the use of all tools and tech­niques and review all projects before start­ing. The projects and all oth­er mate­r­i­al on this site are pre­sent­ed as is, with no war­ran­ty or guar­an­tee of any kind expressed or implied. The own­er and authors dis­claim any lia­bil­i­ty for injury, dam­age or loss that may occur when using any of the con­tent of this web site. When in doubt seek pro­fes­sion­al instruc­tion and advice before under­tak­ing any project.